Ten yeas ago at the Obafemi Awolowo University, Ile-Ife, Nigeria; thousands of undergraduate students had found their new joy, freedom. They were away from parents, had little to do and apart from their course-works and tests, everything was fun. As undergrads, students could attend some lectures, skive the tough ones and meet cool new friends and hang out talking about the future and every nice thing you can dream of while on campus. However, three fresh undergraduates were thinking different. Sulaiman Balogun, a Lawyer, Fikayo Ogundipe and Seyi Ayeni, both Electrical Engineers and Oladapo Eludire an Estate Surveyor were thinking of changing the future. Amidst the busy schedules they had, the three were thinking on how to help make life easier. Now, campus done and out in the heat, the three reunited to revive their dream and co-founded ToLet.com.ng to help everyone search for new rental property easily. Their site allows users to search for properties based on style, location and budget and then book a site inspection on the website or call their customer care line to visit those properties of interest. 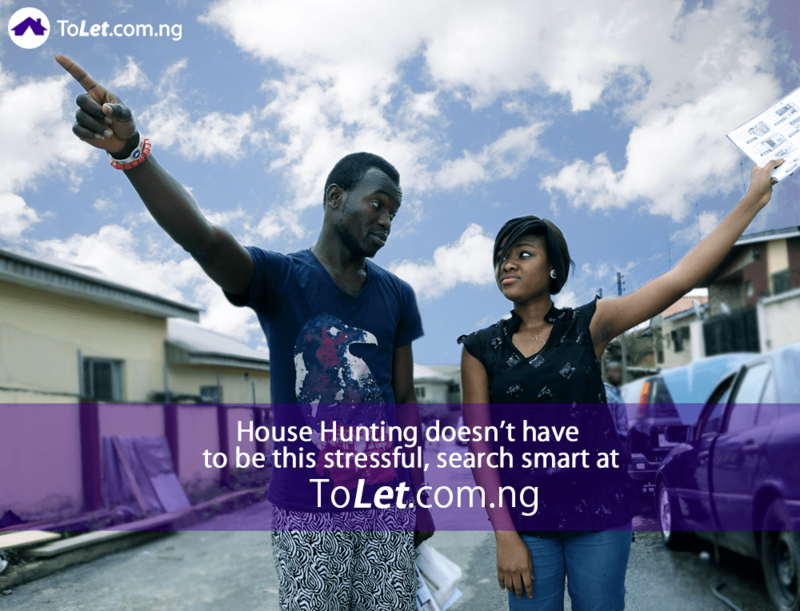 To visit properties, users go along with a ToLet.com.ng Area specialist who will show them as many available properties that fit their search criteria until the user finds the right property. The also help with the physical inspection part of the business, and have recruited Area Specialists for the different zones in Lagos to take their users for inspections and also help them through the negotiation, payment and contract signing aspects of the transaction. With over 3000 properties, a seed fund from Jason Njoku’s Spark and celebrating one year its 2013 March launch ToLet.com.ng wants to become Nigeria 1st Online Lettings Agency. “It’s our mission to provide easy and hassle free access of available property rentals in the city of Lagos. Over the last one year, we have grown from just about 40 listings to over 3000, and have the largest inventory of available rental properties in Lagos; this has thus made us the dominant web platform for property rentals in Lagos. We have also gone from a workforce of four to over thirty full time staff,” Sulaiman Balogun said. ToLet has a different model unlike mushrooming property listing sites, being onlne letting agency, the startup helps prospective tenants search for properties; helps them negotiate with Landlords and Property Agents while for Property Agents, the firm helps them market their listings faster since they have control majority of rental search online. All the property owners do is pay ToLet a percentage of their commissions upon the properties being rented out to users of ToLet.com.ng.Property owners also get direct marketing of their properties on the portal. Users of ToLet.com.ng search for properties on the site free and only have to pay a basic service fee to access use to the site’s Area Specialists and never have to pay any dime afterwards to anyone else. The site eliminates agents who charge fees to tenants at every property or inspection. Balogun says the startup is about to break even from the commission fees generated through direct brief properties from landlords and other property agents. However, they are looking at another round of funding from other venture capital firms. He adds that their rapid growth especially over the last six months has attracted quite some interest from a couple of International VC firms but ToLet is taking its time to ensure they have the right partners before signing anything then eventually roll-out to other major Nigeria cities over the next 18 months. Even with over 3000 properties listed on the site, ToLet’s Balogun says the firm has not done a lot of marketing but their userbase has been generated via a very small online marketing budget and thousands of referrals from satisfied users of the service. The firm hasplans for a full blown marketing campaign from Q2 to help them be the number one property lettings agency not only in Lagos but reach to the rest of the country and possibly start out in one or two other African states.